We are back from our trip to Chicago. In my last post I stated that we were going to visit our daughter Krista in Chicago over the weekend. We had a great time with her and I loved seeing her. We also visited some of Mike’s family while we were there. Mike’s sister lives in the suburbs and it is always a good time when we get together with her and her family. Plus Mike’s younger sister from Tampa was in Chicago, so we got to see all kinds of family. It was almost like a family reunion. My only complaint I have for the weekend in Chicago was that it went way too fast. I brought Krista the apple streusel muffins from my last post, but I did want to bring something to go along with the muffins. I did not make that many muffins and I wanted to make sure that she had other things to eat also. It must be the mom in me; I am always worried that someone will go hungry. Krista is quite a healthy eater, so I wanted to make something healthy, but something that she would enjoy too. 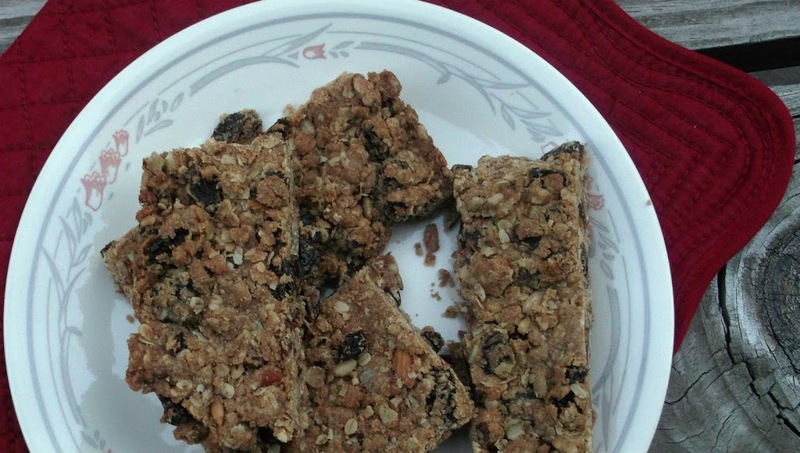 While paging through my recipe book, Joy Of Cooking I found a recipe for energy bars. To me they sounded perfect for a nice breakfast. I have made homemade granola years ago and this was somewhat like that granola. 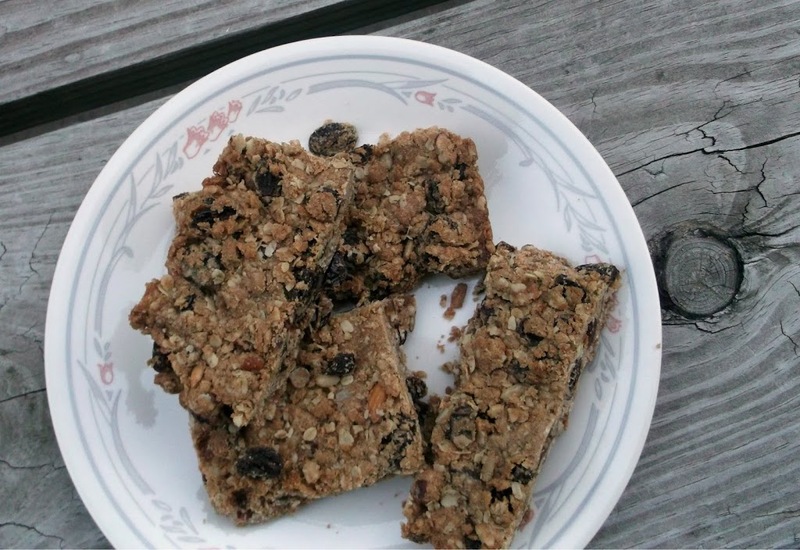 Oats, nuts, and raisins made these energy bars a little healthier and tasty. The recipe called for all-purpose flour, but I used mostly whole wheat flour to go with the healthy theme. I could not resist trying a sample when they were done baking. I loved the taste of these bars, they were a little crumbly, but I did not find that as a problem. Looking for a healthy treat? I would suggest these yummy energy bars. Preheat the oven to 350 degrees F. Grease a 9 x 13 baking pan lined with foil. Press the mixture into the pan. Bake until top is golden brown, about 30 minutes. Cool in the pan on a rack. Lift the foil out of the pan and cut the bars into desired sizes. Delicious! I like pecans and peanut butter, together with those lovely seeds – Yum! I have a feeling these would be gobbled right up in my house. One of the interesting things about The Joy of Cooking is how it’s evolved over the years. When it was first published energy bars didn’t exist, now they include them! I keep several editions of the cookbook around, because they have dropped some of my favorite recipes over the years. Anyway, great recipe! 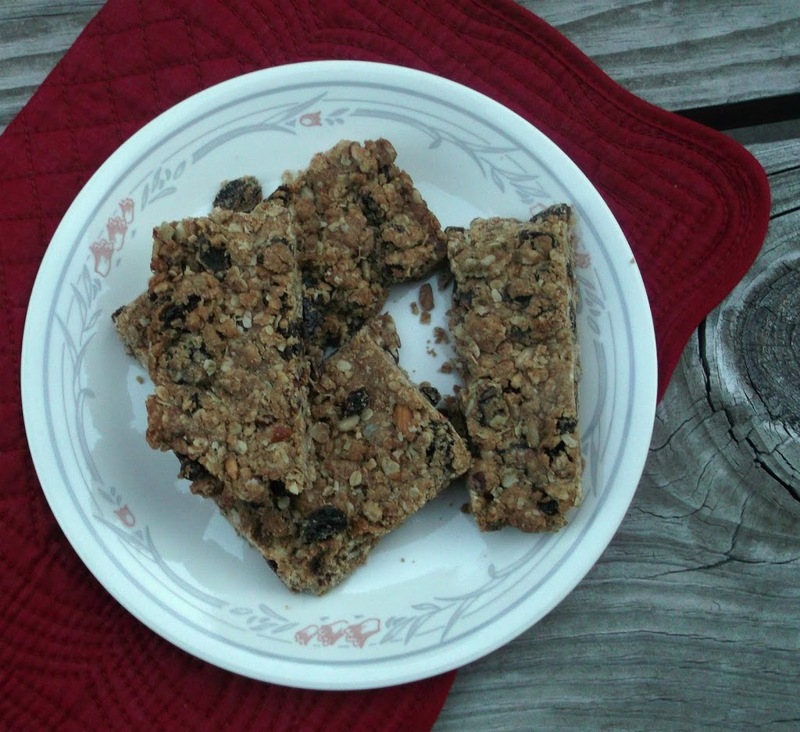 I’ve never made my own energy bars – I should give it a try. I like all the great ingredients you’ve packed into these bars! They look yummy!